Online slots celebrating the finer things in life have been around since online slots began, and generally speaking, games with jewels, money or treasure as their main theme tend to be fairly generous on the riches front. Whether it’s the cash-themed Crazier Jewelry from Sheriff Gaming, or IGT’s classic Renaissance-inspired slot, Da Vinci Diamonds, slots manufacturers know what side of their bread to butter. It’s a shame, then, that the riches – if you’re lucky enough to bag any – in Play'n Go’s simple slot, Jewel Box, are so hard to come by. This is quite disappointing news for fans of Play'n Go slots because usually they deliver on the reward front and that is something that would have been expected in this slot. A 5 reel, 15 pay-line game, betting is very much at the lower end of the spectrum, with a max line bet of just $1.25. However, there are multipliers to be had – but more of that later. On the reels it’s very much Starburst as we go, with pearls, diamonds, rubies and emeralds taking up space on the game screen. 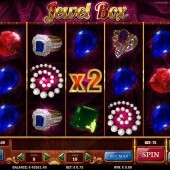 Five diamond rings pays out the jackpot of 2,500x your line bet, and is most definitely the symbol to be focusing on. Rather than one Wild in Jewel Box (see, I said there would be more of that later) there are four, and they simply take the form of a multiplier symbol, ranging from 2x to 5x. They substitute for all symbols other than the Bonus Scatter, and when forming a winning combo will apply themselves to your win. 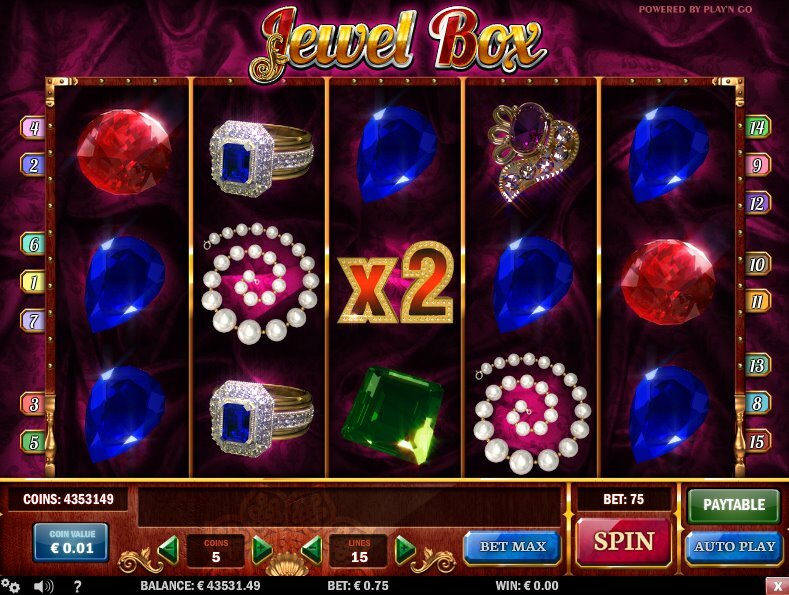 The Jewel Box of the title is the game’s Scatter, and three or more of them activates a Click Me Bonus round. When you hit three, simply choose one of the winning icons to reveal a cash win, anything up to 150x your total bet. The graphics and FX are nice enough, and everything moves with Play'n Go’s customary smoothness but I would have liked to have seen a little extra on the bonus front – even just a free spins round to top things off. Having said that, the Wild multipliers idea is nice, and the Click Me Bonus is perfectly fine. For bigger bettors you may want to shop elsewhere if you’re going to win enough to buy your loved ones some of the rocks featured on the reels here.